Product prices and availability are accurate as of 2019-02-22 01:31:05 EST and are subject to change. Any price and availability information displayed on http://www.amazon.com/ at the time of purchase will apply to the purchase of this product. 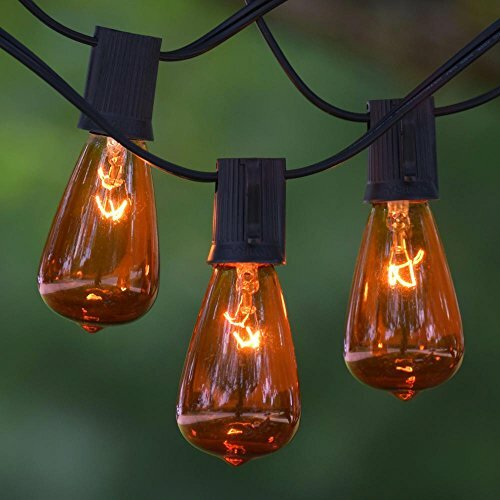 Comes with 100 of the vintage edison amber bulbs (7 watts each). Bulb size: 2" wide and 3" high with base. Average bulb life: 2,500 hours 12" spacing between sockets (there is 1 bulb per foot of strand, e.g., 25 ft. strand holds 25 bulbs). Can use up to a 10 watt bulb. Max run is 840 watts. If one bulb burns out, the rest stay lit. Single ended. There is no female plug on this cord.Manufactured with 18 AWG wire, fused plug and high-quality sockets. Indoor or outdoor use. Assembly required. Bulbs will need to be screwed in. Comes with 100 of the vintage edison amber bulbs (7 watts each). Bulb size: 2" wide and 3" high with base. Average bulb life: 2,500 hours 12" spacing between sockets (there is 1 bulb per foot of strand, e.g., 25 ft. strand holds 25 bulbs). Can use up to a 10 watt bulb. Max run is 840 watts. If one bulb burns out, the rest stay lit.